Geologic-hazard publications report on areas that may be subject to the effects of earthquakes, landslides, debris flows, rock falls, poor soil conditions, radon, or floods. This list of primarily UGS publications is not comprehensive for each region. Additional geologic-hazard publications are available at Geologic Hazard Maps, Paleoseismology of Utah, and the UGS Library. Geologic-hazard publications are listed under individual counties. Click county on list. Geologic hazard maps may also be available for this county. Harty, K.M., editor, 1992, Engineering and environmental geology of southwestern Utah: Utah Geological Association Guidebook 21, 342 p.
Forster, R.R., 2006, Land subsidence in southwest Utah from 1993 to 1998 measured with interferometric synthetic aperture radar (InSAR): Utah Geological Survey Miscellaneous Publication 06-5, 30 p.
Lund, W.R., editor, 1995, Environmental and engineering geology of the Wasatch Front region: Utah Geological Association Guidebook 24, 541 p.
Bowman, S.D., Beisner, K., and Unger, C., 2009, Compilation of 1970s Woodward-Lundgren & Associates Wasatch fault investigation reports and oblique aerial photography, Wasatch Front and Cache Valley, Utah and Idaho: Utah Geological Survey Open-File Report 548, 3 p., 6 plates, DVD. Christopher B. DuRoss, Stephen F. Personius, Anthony J. Crone, Greg N. McDonald, and Richard W. Briggs, 2012, Late Holocene earthquake history of the Brigham City segment of the Wasatch fault zone at the Hansen Canyon, Kotter Canyon, and Pearsons Canyon trench sites, Box Elder County, Utah: Utah Geological Survey Special Study 142, 62 p., 3 plates, CD. Hylland, M.D., 2007, Surficial-geologic reconnaissance and scarp profiling on the Collinston and Clarkston Mountain segments of the Wasatch Fault Zone, Box Elder County, Utah – paleoseismic inferences, implications for adjacent segments and issues for diffusion-equation scarp-age modeling – Paleoseismology of Utah, Volume 15: Utah Geological Survey Special Study 121, 18 p., compact disk. Lund, W.R., Bowman, S.D., and Piety, L.A., 2011, Compilation of U.S. Bureau of Reclamation seismotectonic studies in Utah, 1982-1999 – Paleoseismology of Utah, Volume 20, 2011: Utah Geological Survey Miscellaneous Publication 11-2, 4 p., compact disk. McCalpin, J.P., and Forman, S.L., 2002, Post-Provo paleoearthquake chronology of the Brigham City segment, Wasatch fault zone, Utah – Paleoseismology of Utah, Volume 11: Utah Geological Survey Miscellaneous Publication 02-9, 46 p.
Pechmann, J.C., Nava, S.J., and Arabasz, W.J., 1992, Seismological analysis of four recent moderate (ML 4.8 to 5.4) earthquakes in Utah: Utah Geological Survey Contract Report 92-1, 107 p.
Personius, S.F., 1991, Paleoseismic analysis of the Wasatch fault zone at the Brigham City trench site, Brigham City, Utah and the Pole Patch trench site, Pleasant View, Utah – Paleoseismology of Utah, Volume 2: Utah Geological Survey Special Study 76, 39 p.
Black, B.D., Giraud, R.E., and Mayes, B.H., 2000, Paleoseismic investigation of the Clarkston, Junction Hills, and Wellsville faults, West Cache fault zone, Cache County, Utah – Paleoseismology of Utah, Volume 9: Utah Geological Survey Special Study 98, 23 p., 1 plate. McCalpin, J.P., 1994, Neotectonic deformation along the East Cache fault zone, Cache County, Utah – Paleoseismology of Utah, Volume 5: Utah Geological Survey Special Study 83, 37 p.
Case, W.F., 2000, Notable Utah rock falls in the 1990s and 1980s: Utah Geological Survey Open-File Report 373, 11 p.
Lips, E.W., 1993, Characteristics of debris flows in central Utah, 1983 Utah Geological Survey Contract Report 93-3, 66 p.
Beukelman, G., and Erickson, B., 2012, Reconnaissance of landslides and preliminary landslide hazard assessment along a portion of Browns Park road, Daggett County, Utah: Utah Geological Survey Report of Investigation 271, 14 p., CD. Ashland, F.X., 2002, Review of slope-stability-analyses reports for the proposed Hidden Hideaway Unit No. 1 residential subdivision, Layton, Utah inElliott, A.H., compiler, Technical reports for 2002-2009, Geologic Hazards Program: Utah Geological Survey Report of Investigation 269, p. 223-227. Lowe, M., editor, 1990, Geologic hazards and land-use planning – background, explanation, and guidelines for development in Davis County in designated geologic hazards special study areas: Utah Geological Survey Open-File Report 198, 75 p.
Ala, S.N., 1995, Bedrock structure, lithology and ground water influences on slope failure initiation in Davis County, Utah: Utah Geological Survey Contract Report 95-4, 236 p.
Eblen, J.S., 1995, A probabilistic investigation of slope stability in the Wasatch Range, Davis County, Utah: Utah Geological Survey Contract Report 95-3, 98 p.
Giruad, R.E., and Castleton, J.J., 2009, Estimation of potential debris-flow volumes for Centerville Canyon, Davis County, Utah: Utah Geological Survey Report of Investigation 267, 33 p., CD. Keaton, J.R., Anderson, L.R., and Mathewson, C.C., 1991, Assessing debris flow hazards on alluvial fans in Davis County, Utah: Utah Geological Survey Contract Report 91-11, 167 p.
Lips, E.W., 1993, Characteristics of debris flows in central Utah, 1983: Utah Geological Survey Contract Report 93-3, 66 p.
Nelson, A.R., Lowe, M., Personius, S., Bradley, L., Forman, S.L., Klauk, R., and Garr, J., 2006, Holocene earthquake history of the northern Weber segment of the Wasatch fault zone, Utah – Paleoseismology of Utah, Volume 13: Utah Geological Survey Miscellaneous Publication 05-8, 39 p., 2 plates. Ashland, F.X., 2009, Snowmelt-induced ground-water fluctuations in selected northern Utah landslides – preliminary results from the 2007-08 landslide water year: Utah Geological Survey Open-File Report 550, 19 p.
Ashland, F.X., 2003, Characteristics, causes, and implications of the 1998 Wasatch Front landslides: Utah Geological Survey Special Study 105, 49 p.
Ashland, F.X., Giraud, R.E., and McDonald, G.N., 2005, Ground-water-level fluctuations in Wasatch Front landslides and adjacent slopes, northern Utah: Utah Geological Survey Open-File Report 448, 22 p.
Hylland, M.D., and Lowe, M., 1998, Characteristics, timing, and hazard potential of liquefaction-induced landsliding in the Farmington Siding landslide complex, Davis County, Utah: Utah Geological Survey Special Study 95, 38 p.
Lund, W.R, Knudsen, T.R., and Vice, G.S., 2008, Paleoseismic reconnaissance of the Sevier fault, Kane and Garfield Counties, Utah – Paleoseismology of Utah, Volume 16: Utah Geological Survey Special Study 122, 31 p., compact disk. Lund, W.R., Hozik, M.J., and Hatfield, S.C., 2007, Paleoseismic investigation and long-term slip history of the Hurricane fault in southwestern Utah – Paleoseismology of Utah, Volume 14: Utah Geological Survey Special Study 119, 81 p., compact disk. Forster, R.R., 2012, Evaluation of Interferometric synthetic aperture radar (InSAR) techniques for measuring land subsidence and calculated subsidence rates for the Escalante Valley, Utah, 1998 to 2006: Utah Geological Survey Open-File Report 589, 25 p, CD. Katzenstein, K., 2012, InSAR analysis of ground surface deformation in Cedar Valley, Iron County, Utah: Utah Geological Survey Miscellaneous Publication 13-5, 43 p, CD. Knudsen, T., Inkenbrandt, P., Lund, W., Lowe, M., and Bowman, S., 2014,Investigation of land subsidence and earth fissures in Cedar Valley, Iron County, Utah: Utah Geological Survey Special Study 150, 84 p., 8 appendices, CD. DuRoss, C.B., and Kirby, S.M., 2004, Reconnaissance investigation of ground cracks along the western margin of Parowan Valley, Iron County, Utah: Utah Geological Survey Report of Investigation 253, 17 p., compact disk. Lund, W.R., DuRoss, C.B., Kirby, S.M., McDonald, G.N., Hunt, G., and Vice, G.S., 2005, The origin and extent of earth fissures in Escalante Valley, southern Escalante Desert, Iron County, Utah: Utah Geological Survey Special Study 115, 30 p., compact disk. DuRoss, C.B., 2014, Paleoseismic investigation to determine the mid-Holocene chronology of surface-faulting earthquakes on the Nephi segment of the Wasatch fault zone, Utah and Juab Counties, Utah: Final technical report to the U.S. Geological Survey, National Earthquake Hazards Reduction Program, award no. G12AP20076, 48 p., 2 plates. Jackson, M., 1991, The number and timing of paleoseismic events on the Nephi and Levan segments, Wasatch fault zone, Utah – Paleoseismology of Utah, Volume 3: Utah Geological Survey Special Study 78, 23 p., 3 plates. Machette, M.N., Crone, A.J., Personius, S.F., Mahan, S.A., Dart, R.L., Lidke, D.J., and Olig, S.S., 2007, Paleoseismology of the Nephi segment of the Wasatch fault zone, Juab County, Utah – Preliminary results from two large exploratory trenches at Willow Creek: U.S. Geological Survey Scientific Investigations Map 2966, 2 sheets. Ashland, F.X., McDonald, G.N., Shaw, L.M., and Bay, J.A., 2009,Characterization and hazard zonation of the Meadow Creek landslide affecting State Route 9, part of the Coal Hill landslide complex, western Kane County, Utah: Utah Geological Survey Special Study 131, 31 p., 2 plates, CD. Kaliser, B.N., Geologic hazards in Morgan County with applications to planning: Utah Geological and Mineralogical Survey Bulletin 93, 56 p., 2 plates. Piety, L.A., Anderson, L.W., and Ostenaa, D.A, 2010, Late Quaternary faulting in East Canyon Valley, Northern Utah – Paleoseismology of Utah, Volume 19: Utah Geological Survey Miscellaneous Publication 10-5, 40 p., CD. Kaliser, B.N., 1972, Environmental geology of Bear Lake area, Rich County, Utah: Utah Geological and Mineral Survey Bulletin 96, 32 p., 2 plates. McCalpin, J.P., 2003, Neotectonics of Bear Lake Valley, Utah and Idaho; a preliminary assessment – Paleoseismology of Utah, Volume 12: Utah Geological Survey Miscellaneous Publication 03-4, 43 p.
Bauman, R.D., 1965, Foundation characteristics of sediments, Salt Lake Metropolitan Area: Utah Geological and Mineralogical Survey Special Studies 10, 40 p., 3 plates. Lund, W.R., editor, 1990, Engineering geology of the Salt Lake City metropolitan area: Utah Geological Survey Bulletin 126, 66 p.
Adan, S.M., and Rollins, K.M., 1993, Damage potential index mapping for Salt Lake Valley, Utah: Utah Geological Survey Miscellaneous Publication 93-4, 64 p.
Black, B.D., Lund, W.R., Schwartz, D.P., Gill, H.E., and Mayes, B.H., 1996, Paleoseismic investigation on the Salt Lake City segment of the Wasatch fault zone at the South Fork Dry Creek and Dry Gulch sites, Salt Lake County, Utah – Paleoseismology of Utah, Volume 7: Utah Geological Survey Special Study 92, 22 p., 1 plate. Christenson, G.E., 1992, The March 16, 1992 ML 4.2 western Traverse Mountains earthquake, Salt Lake County, Utah: Utah Geological Survey Open-File Report 255, 18 p.
DuRoss, C.B., and Hylland, M.D., 2014, Evaluating surface faulting chronologies of graben-bounding faults in Salt Lake Valley, Utah-New paleoseismic data from the Salt Lake City segment of the Wasatch fault zone and the West Valley fault zone – Paleoseismology of Utah, Volume 24: Utah Geological Survey Special Study 149, CD, 76 p. + 14 appendices. Hiscock, A.I. and DuRoss, C.B., 2016, Late Holocene chronology of surface-faulting earthquakes at the Corner Canyon site on the Salt Lake City segment of the Wasatch fault zone, Salt Lake County, Utah: Final technical report to the U.S. Geological Survey, National Earthquake Hazards Reduction Program, award no. G14AP00057, 25 p., 2 plates. 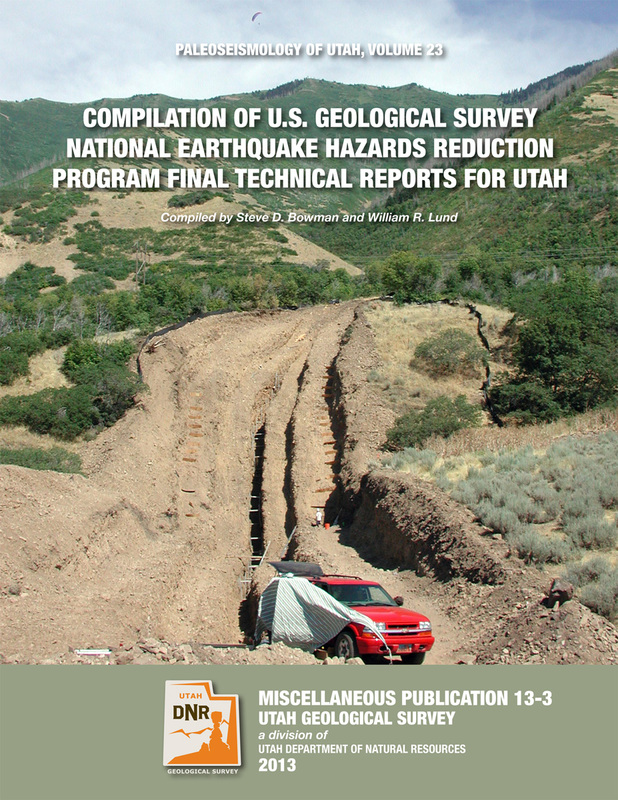 Hylland, M.D., Hiscock, A.I., McDonald, G.N., 2017, Paleoseismic Investigation of the Taylorsville Fault, West Valley Fault Zone, Salt Lake County, Utah: Final technical report to the U.S. Geological Survey, National Earthquake Hazards Reduction Program, award no. G15AP00117, 41 p. + 7 appendices, 2 plates. Keaton, J.R., and Currey, D.R., 1993, Earthquake hazard evaluation of the West Valley fault zone in the Salt Lake City urban area, Utah: Utah Geological Survey Contract Report 93-7, 69 p.
Keaton, J.R., Currey, D.R., and Olig, S.J., 1993, Paleoseismicity and earthquake hazards evaluation of the West Valley fault zone, Salt Lake City urban area, Utah: Utah Geological Survey Contract Report 93-8, 55 p.
McCalpin, J.P., 2002, Post-Bonneville paleoearthquake chronology of the Salt Lake City segment, Wasatch fault zone, from the 1999 “megatrench” site – Paleoseismology of Utah, Volume 10: Utah Geological Survey Miscellaneous Publication 02-7, 38 p.
Radkins, H., Murphy, M., and Schuster, G.T., 1989, Subsurface map and seismic risk analysis of the Salt Lake Valley: Utah Geological Survey Open-File Report 152, 82 p. 4 plates. Solomon, B.J., Neil Storey, Ivan Wong, Walter Silva, Nick Gregor, Douglas Wright, and Greg McDonald, 2004, Earthquake-hazards scenario for a M7 earthquake on the Salt Lake City segment of the Wasatch fault zone, Utah: Utah Geological Survey Special Study 111DM, 59 p., 6 plates, scale 1:250,000, compact disk. Wong, I.G., and Siva, W.J., 1993, Site-specific strong ground motion estimates for the Salt Lake Valley: Utah Geological Survey Miscellaneous Publication 93-9, 34 p.
Ashland, F.X., 2008, Reconnaissance of the Little Valley landslide, Draper, Utah-evidence for possible late Holocene, earthquake-induced reactivation of a large pre-existing landslide: Utah Geological Survey Open-File Report 520, 17 p.
West, M.W., 1994, Seismotectonics of north-central Utah and southwestern Wyoming – Paleoseismology of Utah, Volume 4: Utah Geological Survey Special Study 82, 93 p., 5 plates, scale 1:100,000. Arabasz, W.J., Pechman, J.C., and Brown, E.D., 1989, Evaluation of seismicity relevant to the proposed siting of a superconducting supercollider (SSC) in Tooele County, Utah: Utah Geological Survey Miscellaneous Publication 89-1, 107 p.
Everitt, B.L., and Kaliser, B.N., 1980, Geology for assessment of seismic risk in the Tooele and Rush Valleys, Tooele County, Utah: Utah Geological and Mineral Survey Special Study 51, 33 p., 5 plates, scales 1:50,000 and 1:250,000. Lund, W.R., editor, 1996, The Oquirrh fault zone, Tooele County, Utah – surficial geology and paleoseismicity – Paleoseismology of Utah, Volume 6: Utah Geological Survey Special Study 88, 64 p., 2 plates, scale 1:24,000. DuRoss, C.B., McDonald, G.N., and Lund, W.R., 2008, Paleoseismic investigation of the northern strand of the Nephi segment of the Wasatch fault zone at Santaquin, Utah – Paleoseismology of Utah, Volume 17: Utah Geological Survey Special Study 124, 33 p., 1 plate., compact disk. Lund, W.R., and Black, B.D., 1998, Paleoseismic investigation at Rock Canyon, Provo segment, Wasatch fault zone, Utah county, Utah – Paleoseismology of Utah, Volume 8: Utah Geological Survey Special Study 93, 21 p., 2 plates. Lund, W.R., Schwartz, D.P., Muvey, W.E., Budding, K.E., and Black, B.D., 1991,Fault behavior and earthquake recurrence on the Provo segment of the Wasatch fault zone at Mapleton, Utah County, Utah – Paleoseismology of Utah, Volume 1: Utah Geological Survey Special Study 75, 41 p.
Case, W.F., 1985, Dam failure inundation study for Deer Creek Dam, Utah County, Utah: Utah Geological and Mineral Survey Report of Investigation 197, 37 p., 4 plates, approximate scale 1:38,000. Ashland, F.X., 2005, Preliminary assessment of two landslides in 2005 between a sewer line and Gordon Creek, Mountain Green, Morgan County, Utah inElliott, A.H., compiler, Technical reports for 2002-2009, Geologic Hazards Program: Utah Geological Survey Report of Investigation 269, p. 134-142. Solomon, B.J., 2002, Review of “Engineering geology assessment, 30-acre parcel, Deer Creek Drive, Timber Lakes development, Wasatch County, Utah”inElliott, A.H., compiler, Technical reports for 2002-2009, Geologic Hazards Program: Utah Geological Survey Report of Investigation 269, p. 248-250. Solomon, B.J., 2003, Review of “Geologic and geotechnical report – proposed North Village at Jordanelle Ridge development, Wasatch County, Utah” inElliott, A.H., compiler, Technical reports for 2002-2009, Geologic Hazards Program: Utah Geological Survey Report of Investigation 269, p. 276-279. Christenson, G.E., and Bishop, C.E., 1985, Preliminary geologic hazard and resource inventory for state lands in Washington County, Utah: Utah Geological and Mineral Survey Report of Investigation 199, 14 p.
Christenson, G.E., editor, 1995, The September 2, 1992 ML 5.8 St. George earthquake, Washington County, Utah: Utah Geological Survey Circular 88, 41 p.
Lund, W.R., Knudsen, T.R., and Bowman, S.D., 2014, Investigation of the December 12, 2013, fatal rock fall at 368 West Main Street, Rockville, Utah: Utah Geological Survey Report of Investigation 273, 20 p.
Lowe, M., editor, 1990, Geologic hazards and land-use planning – background, explanation, and guidelines for development in Weber County in designated geologic hazards special study areas: Utah Geological Survey Open-File Report 197, 70 p.
McDonald, G.N., and Ashland, F.X., 2005, Review of “Geotechnical study, Riverdale housing development, 5633 South 1200 West, Riverdale, Utah”inElliott, A.H., compiler, Technical reports for 2002-2009, Geologic Hazards Program: Utah Geological Survey Report of Investigation 269, p. 364-367. McDonald, G.N., and Christenson, G.E., 2003, Review of “Geotechnical/geological study, Kunzler subdivision, 6260 South 2125 East, Weber County, Utah”in Elliott, A.H., compiler, Technical reports for 2002-2009, Geologic Hazards Program: Utah Geological Survey Report of Investigation 269, p. 260-263. DuRoss, C.B., Personius, S.F., Crone, A.J., McDonald, G.N., and Lidke, D.J., 2009, Paleoseismic investigation of the northern Weber segment of the Wasatch fault zone at Rice Creek trench site, North Ogden, Utah – Paleoseismology of Utah, Volume 18: Utah Geological Survey Special Study 130, 37 p., 2 plates, compact disk. Christenson, G.E., and Ashland, F.X., compilers, 2007, A plan to reduce losses from geologic hazards in Utah – recommendations from the Governor’s Geologic Hazard Working Group 2006-2007: Utah Geological Survey Circular 104, 30 p.
Machette, Michael N., editor, 1988, In the footsteps of G.K. Gilbert–Lake Bonneville and neotectonics of the eastern Basin and Range Province: Utah Geological and Mineral Survey Miscellaneous Publication 88-1, 120 p.
Arabasz, W.J., editor, 1991, A guide to reducing losses from future earthquakes in Utah – Consensus document: Utah Geological Survey Miscellaneous Publication 91-1, 30 p.
Lund, W.R., 2005, Consensus preferred recurrence-interval and vertical slip-rate estimates – review of Utah paleoseismic-trenching data by the Utah Quaternary Fault Parameters Working Group: Utah Geological Survey Bulletin 134, 109 p.
Lund, W.R., 2014, Hazus loss estimation software earthquake model revised Utah fault database, updated through 2013: Utah Geological Survey Open-File Report 631, 11 p.
Lund, W.R., complier, 2013, Working Group on Utah Earthquake Probabilities preliminary fault characterization parameters for faults common to the working group study area and the U.S. National Seismic Hazard Maps, data provided to the U.S. Geological Survey for use in the 2014 update of the National Seismic Hazard Maps in Utah: Utah Geological Survey Open-File Report 611, 6 p.
Lund, W.R., editor, 1998, Proceedings volume, Basin and Range province seismic-hazards summit: Utah Geological Survey Miscellaneous Publication 98-2, 204 p.
Lund, W.R., editor, 2005, Proceedings volume, Basin and Range province seismic-hazards summit II: Utah Geological Survey Miscellaneous Publication 05-2, variously paginated, compact disk. Lund, W.R., editor, 2006, Basin and range province earthquake working group seismic-hazard recommendations to the U.S. Geological Survey National Seismic Hazard Mapping Program: Utah Geological Survey Open-File Report 477, 23 p.
Elliott, A.H., and Kirschbaum, M.J., 2007, The preliminary landslide history database of Utah, 1850-1978: Utah Geological Survey Open-File Report 514, 8 p., digital data. Mulvey, W.E., 1992, Soil and rock causing engineering geologic problems in Utah: Utah Geological Survey Special Study 80, 23 p., 2 plates, scale 1:500,000. Sprinkel, D.A., and Solomon, B.J., 1990, Radon hazards in Utah: Utah Geological Survey Circular 81, 24 p.